With DJ Java Decompiler you can decompile java class-files and save it in text or other format. It's simple and easy. DJ Java Decompiler is Windows XP, Windows 2003, Windows Vista, Windows 7, Windows 8, 8.1 and 10 decompiler and disassembler for Java that reconstructs the original source code from the compiled binary CLASS files (for example Java applets). DJ Java Decompiler is able to decompile complex Java applets and binaries, producing accurate source code. It lets you quickly obtain all essential information about the class files. It might be easy to decompile the Java files with DJ Java Decompiler. DJ Java Decompiler is a stand-alone Windows application; it doesn't require having Java installed! DJ Java Decompiler is not just Java decompiler and disassembler but it is also a fully featured Java editor using the graphical user interface with syntax-coloring. Using DJ Java Decompiler is easy. Select "Open" and load your desired class file, or just double-click the CLASS file you want to decompile. DJ Java Decompiler supports drag-and-drop functions for OLE. You will see the source code instantly! In "Windows Explorer" Right mouse-button pop-up menu available too. You can decompile or disassembler a CLASS files on your computer hard disk or on a network drive that you have a connection to (you must have write privileges or just change the default output directory for .jad files). You don't need to have the Java Virtual Machine or any other Java SDK installed. But this release is able to compile, run, create JAR archives and run applets outside of the context of a Web browser when JDK is installed. With DJ Java Decompiler you can decompile more than one java class file at one time. "Tools"-> "Decompile more files..." allows you to select and decompile more than one Java compiled file at one time. This release enables users to decompile "dead" parts of code. It can add the original line numbers as the comments in the decompiled file, that is very useful for debugging. DJ Java Decompiler is suitable for studying JAVA bytecode. The program enables users to save, print, edit and compile the generated java code. Included Applet Tag Editor enables users to create applets quickly. Included "Archiver" tool is a simple archive file manager wich enables users to work with .JAR, .ZIP, .APK, .EAR, .WAR and .EXE archives. (see New features in version 3.12.12.101 and New features in version 3.12.12.96). This tool lets you create or view archives, extract files from archives, decompile .class files from archives, etc. The option "Use folder names stored in archive" enables users to decompile whole class tree. The "Hexadecimal View" - F11 shows the file in hexadecimal. This view lets you examine the file at the lowest possible level. Special information features added in this latest version: "Class version info" (shows the JVM version, Major and Minor version), "Access flags", "Superclass", "Methods, Interfaces and Constant Pool", "Fields", "Attributes", "General Information". The old version of DJ Java Decompiler - 3.7.7.81 was a freeware software. You can still find it on: http://dj.navexpress.com/. If you already have a copy and are happy with it, you are welcome to continue using it. If you like this program and want to help it's author to continue working on it and improving it, you may contribute a modest / small donation, which I would be extremely grateful to receive from you! If you have any questions regarding DJ Java Decompiler, please mail to at_neshkov@yahoo.com ! DJ Java Decompiler is intuitive enough that you can probably skip the instructions. Once you have downloaded and installed it, use the "File" -> "Open" dialog to open your CLASS or JAR file. Select "File" -> "Open" and load your desired class file. Select "File" -> "Open in New Window" if you want to open the class file in new program instance. In Windows Explorer right mouse-button pop-up menu is available too. - "Open with DJ"
To decompile a .JAR file: Select "File" -> "Open" and load your desired jar file. This jar file will be loaded in the "Archiver" tool. Use "Archiver" tool to decompile a single class file inside the selected archive or all class tree. To decompile a single class file inside the JAR archive - just double-click the class file. To decompile the whole class tree: Select "Tools" -> "Decompile more files...". Click "Whole class tree" radio-button. Select the directory with classes and the destination directory. Click on "Decompile" button. When user opens and decompiles a class file, DJ Java Decompiler creates a temporary file with .jad extension. By default the output folder is the folder of the class file. The most common problem with DJ Java Decompiler is when the user doesn't have write privileges on this output folder (for example from CD or DVD drives). To solve this user can select another output location for .jad files from "Settings" - "Configuration" - "General" tab - un-check "Use Default Output Directory for .JAD files" - "Select Output Directory for .JAD files". User needs to change the output location of .jad files when working on slow media (floppy disks, tapes, external devices) or on network drives. Why is a DJ Java Decompiler useful? DJ Java Decompiler is useful for recovery of lost or accidentally destroyed source code. Decompiling Java is an excellent way of learning both Java and how the Java VM works. DJ Java Decompiler makes it easy to peek into Java classes and learn from the source. Its easy to use and intuitive graphical user interface eases the learning curve for new starters in Java. Fixing and debugging .class files. Use DJ Java Decompiler when developers are slow to respond to questions that need immediate answers. 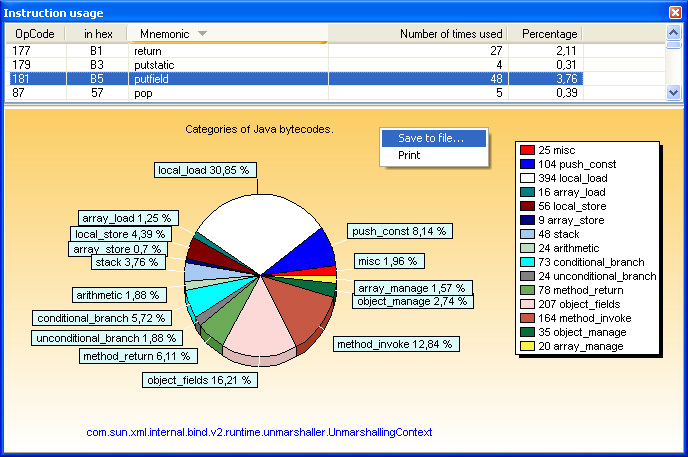 DJ Java Decompiler is useful for exploring the sources of Java runtime libraries. Like the possibility to inline bytecode. To check the results of your class file obfuscation;) It's really useful to ensure that your code is adequately obfuscated before releasing it into the public domain. All in all, DJ Java Decompiler can be a very handy development tool in your arsenal. "View" - "Attributes" displays new attributes in Java 1.6. This will display properly the InnerClasses attribute. "View" - "Fields" now shows all field_info structure: access_flags, attributes_count and attributes. "Save to file..." popup menu item is available too. "View" - "Methods, Interfaces and Constant Pool" "Disassembly" tab displays the bytecode in assembly notation. "View" - "Methods, Interfaces and Constant Pool" "Attributes" tab displays all the specific information for the selected attribute. "View" - "Methods, Interfaces and Constant Pool" "Exception Table" tab displays the exception table of the method. Using DJ Java Decompiler, you can reconstruct the source code of an applet or binary .class file, and review its methods, fields, interfaces, attributes, exceptions etc. that would normally be unavailable to anyone other than the original programmer. Updated decompiler engine files. See "Settings" - > "Decompiler Settings" - > check "Use alternative decompiler engine (Don’t use JAD as decompiler engine)” checkbox. 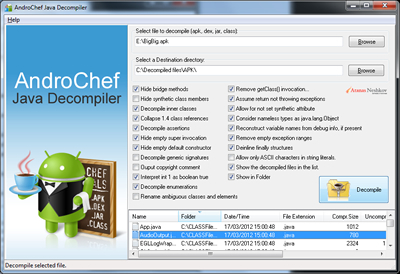 Checkbox "Use alternative decompiler engine (Don’t use JAD as decompiler engine)” added in "Decompile more files..." tool. "Edit" - "Unescape" menu item added to convert escaped Java entities into string. Improvement to handle BootstrapMethods attribute and the new ConstantPool Types: CONSTANT_InvokeDynamic, CONSTANT_MethodType, CONSTANT_MethodHandle. Fixed issue in extracting files case-sensitively in "Archiver" tool and "Search inside compressed archives"
StackMap and StackMapTable attributes are now properly displayed. Improvements and many new features in "View" - "Attributes", "Methods, Interfaces and Constant Pool" and "Fields" forms. Added search capabilities in "Methods" and "Constant Pool" tabs. Specific information for attributes is available and annotations are displayed in Treeview. "Save to file" option added. Bugfix in "Exception Table" tab. "Attributes" form gives a complete description of all ClassFile attributes. Additional "Fields" tab is added. Added a "View" - "Instruction usage" Static bytecode frequency - the number of times a bytecode appears in a class file. Added a new tab "Instruction usage" in "Methods, Interfaces and Constant Pool" Static bytecode frequency - the number of times a bytecode appears in the selected method. Added a new tool "Class file viewer". Bugfixes in "Search for files inside compressed archives". Java Annotation support. RuntimeVisibleAnnotations, RuntimeInvisibleAnnotations, RuntimeVisibleParameter-Annotations, and RuntimeInvisibleParameterAnnotations attributes are supported. Added a new search tool "Search for files inside compressed archives" (.JAR, .ZIP, .WAR, .EAR and .APK). This tool enables users to search for files by file name and a word or phrase in the file. The results list can be sorted by clicking at column header and includes detailed information about files. Added a new tool "Imports Viewer". Lists import statements of selected class file. Added a new tool "Methods Viewer". Shows the methods of selected class file with sorting capabilities. Lists access_flags, descriptors, method signatures, attributes and code length. The results list can be exported to tab-delimited text file. Added capability to calculate .DEX file signature and checksum with "CRC MD5 SHA-1 Calculator" tool. Users can also calculate the Adler-32 and SHA-256 hashes of a file or string. Improvements in "Export to HTML". Compared to the previous version - it is much more powerful now. Unicode conversion allows multi-language documents. Added a drag-and-drop functionality in "Archiver" tool. Added a "Tree View" button in "Archiver". Shows the selected archive (.jar, .zip, .war, .ear, .apk) in Treeview with export to .XML capability. Added a "Whole class tree" option in "Decompile more files" tool. Decompiles all .class files located in all subdirectories of the selected directory and creates output files in subdirectories of the destination folder according to package names of classes. "Browse for files" button added in "Run" tool. Useful to pass the file names as arguments to the main() method. "View" - "Hexadecimal View" (F11) menu item is added. Just like a dedicated hex editor, "Hexadecimal View" shows byte offsets at the left, hexadecimal representation in the middle, and textual representation at the right. Uses the same color scheme as for the editor. This view lets you examine the file at the lowest possible level. You can search hexadecimal characters or words in this view (Ctrl+F). "Go to offset..." (F8) popup menu item is available too. New text formatting capabilities. "Edit" - "Change Case" - "Invert Case"; "Edit" - "ROT-13" and "ROT-47" options added - for simple character encryption and decryption. "View" - "Class version info" shows the JVM version, major and minor version of the currently opened class file. "View" - "Fields" now shows all field_info structure: access_flags, attributes_count and attributes. "Save to file" popup menu item is available too. Changes and bug fixes in "View" - "Methods, Interfaces and Constant Pool". "Exception Table" tab added to display the exception table of the method. Bug fixes in "Methods" - "Disassembly" tab. "Line Number" shows currently selected line number. In "Data" tab you can see the hexadecimal, decimal and binary representation of the selected byte offset. "Save to file" popup menu item is available for "Constant Pool" tab. "Search in Constant Pool" feature is added. "Tools" - "Change multiple files extension" With this tool you can easily rename multiple files that have the same file extension. Also, you can rename all files in sub-directories recursively. "Tools" - "CRC Calculator" added. Calculates CRC16, CRC32, MD5, SHA1 hashes and checksum of a file or string. "Tools" - "HEX-DEC-BIN Calculator" added. This is a simple hexadecimal, decimal and binary calculator (converter). "Tools" - "Packages Tree" shows JavaTM Platform, Standard Edition 6 packages tree. This enables you to insert the selected package into the editor or to the clipboard. "Command prompt" button added. Reads "ComSpec" system environment variable and opens a DOS window in the specified in "Configuration" initial directory. "View" - "Java Version" shows currently installed Java version. "View" - "Java Control Panel" shows Java Control Panel applet. "View" - "Character Map" menu item is added. "Extract All Files" bug is fixed in "Archiver" tool. Changes and bug fixes in all "Search" menu items. Bug fixes in "Refresh" and "Toggle to Bytecode / Sourcecode view". Various bug fixes in the GUI. New menu items in "View" menu added, allows more detailed view of the methods, Constant Pool, interfaces, and attributes. Changes in "Archiver" tool, allows you to change the default output files extension (default is .jad). New features in "Compile", "Run", "JAR" and "Appletviewer". "Associate DJ with...": .class, .java, .jar and .jad files menuitem added in "Settings" menu. This allows DJ to start automatically when user open these files from Windows Explorer, My Computer, etc. New decompiler options added. "Display long integers using the specified radix" and "Display integers using the specified radix" - 8, 10 or 16 options added. New features in "Configuration" -> "Appearance and colors" forms added ("Adjust line breaks"). Changes in "Archiver" tool. This is a complete File Manager type of program that lets you create or view archives, extract files from archives, decompile .class files from archives, etc. Option "Use folder names stored in archive" added when decompiling files in .jar files enables users to decompile all class tree. "Export to HTML" tool added. "Edit" -> "Comment" menuitem added to comment selected text (Ctrl+Alt+C). New decompiler options added. "Debug mode" and "Generate additional casts.." options added. New features in "Compile" and "Run" forms added. Many bugs fixed. New zip dll ’s for "Archiver" tool. Changes in "Decompile more files..." form added, many bugs fixed. 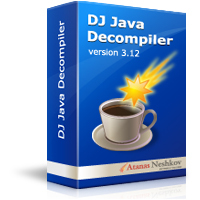 Download DJ Java Decompiler and start using now! DJ Java Decompiler has successfully passed Microsoft-designed tests for compatibility and reliability with Windows® 7 and received "Compatible with Windows 7" logo. © 2000 - 2015 DJ Java Decompiler and Atanas Neshkov All Rights Reserved.